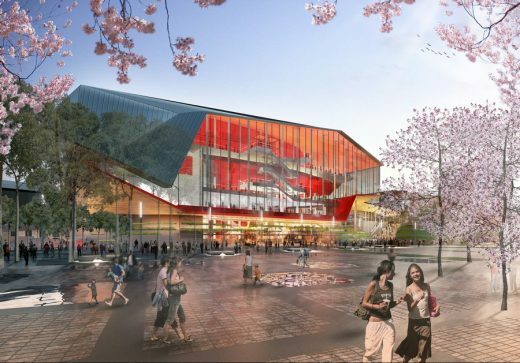 18th December 2012 – Joint venture partners HASSELL + Populous have won the architectural contract for the design of Sydney’s new integrated convention, exhibition and entertainment precinct at Darling Harbour, due for completion in 2016. HASSELL will also design the extensive public parklands and open space within the 20 hectare precinct. HASSELL + Populous are design consultants to Destination Sydney consortium, which has been selected by the New South Wales Government as preferred developer and contractor of the AUD $1 billion facility. The consortium comprises of developer Lend Lease, its infrastructure development business Capella Capital, leading venue managers and operators AEG Ogden, and Spotless, which will deliver Facility Management Services. Ken Maher, HASSELL design leader on the project, said the firm was delighted to take on the challenge of transforming a key Sydney precinct through the design of three major public buildings and the unifying public realm. “The re-making of Darling Harbour is a rare opportunity to design a significant new quarter within the central city,” he said. “It extends the urban fabric and re-connects the city to Ultimo and Pyrmont with more permeable networks of streets and lanes. Importantly it can bring a new level of public amenity for visitors and citizens alike through extended public parkland that is identifiably ‘Sydney’ in character. Populous has designed both the London and Sydney Olympic stadiums in addition to 45 Convention and Exhibition centres around the world. The firm’s senior principal and project leader, Richard Breslin, says Sydney will have a state-of-the-art venue that will showcase the city to the world and revitalise Darling Harbour, both economically and culturally. “It will be a fusion of architecture and landscape, of indoors and outdoors, of engagement, education, living, creative working and entertainment. The project demonstrates the imperative of responsive design to sustain urban life at this critical time for our cities and communities,” he said. Populous’ Richard Breslin added that the project presents a great opportunity for Sydney as a major international destination. “This precinct will reflect the dynamism of Sydney’s cityscape, redefine Darling Harbour, and respect the precinct’s parkland setting. “The landmark Convention Centre, deliberately clad in materials which reflect its spectacular harbour outlook, will be complimented by the rest of the precinct which looks onto parkland. Here, the building’s boundaries are set back, designed so the landscape becomes part of the building, with circulation and meeting spaces open to the park, terraces functioning as meeting spaces, and a huge 5,000 sqm open deck on top of the building providing a platform to be used for major events,” said Breslin. Hong Kong, Rotterdam, 13 December 2012 – The New South Wales Government announced today that Destination Sydney, consisting of Lend Lease, HOSTPLUS, Capella Capital, AEG Ogden and Spotless, is the preferred consortium for Sydney International Convention, Exhibition and Entertainment Precinct (SICEEP) redevelopment. OMA is the master plan designer within the consortium, and is also the conceptual architect of the ICC Hotels within the master plan. Winning team announced for SICEEP redevelopment. OMA’s master plan – with the working title ‘Darling Harbour Live’ – links the CBD, the West and the South of central Sydney together; generates a truly vibrant, exciting and integrated platform for social interaction right in the heart of the city. Darling Harbour Live will consist of a convention, exhibition and entertainment facilities with an activated public realm, commercial facilities, a hotel complex and housing.